This week had me thinking a lot about job satisfaction, and how detrimental it can be to some people’s happiness what they do for 40 hours a week. I certainly know that finding a job best suited to me has done wonders for my confidence and overall attitude to life. I have seen the change in other people too as they experience the ‘light bulb moment’ regarding their professional lives. Now of course a job is not the be all and end all of our lives; but it is certainly a relief to be able to do something you want/like. 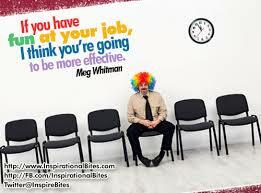 To round-up, here are my top quotes regarding job satisfaction. Great motto! I have been doing that lately and I never would have imagined how easy going to work in the mornings can be.